The challenges of Sacred Heart Church in Altoona were many. One was that the church had a double altar rail. After Vatican II, a wooden altar was constructed and applied onto the existing intricate sanctuary. The beautiful Sacred Heart mosaic was an after-thought with the different colors that were painted previously in the sanctuary. The teal blue, as well as the yellow walls were “dated” and did not complement the existing church. An additional challenge was that the existing sanctuary floor was heated. It was currently surfaced with a mosaic tile. 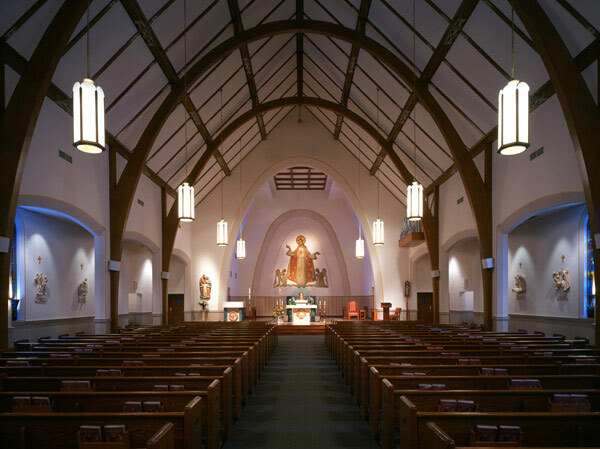 Our Studio re-painted the church in warm, pleasing tones and muted colors which softened the walls and allowed the beauty of the architectural, elliptical spires and the artwork speak for itself. We addressed the side walls with a hard resin compound material that was stone-like in look, but very durable and created a wainscoting. The Stations received their respective lighting and we created nice individual niches along the side walls. Using marbles from the back altar, we re-constructed their new altar of sacrifice, added to the existing piece a new mensa, as well as a new mosaic front panel. The columns that became the four legs of the new altar were from the old supports at the old existing altar. The new marble floor was made out of a three colored marble that complemented both the materials as well as the beautiful stone mosaic behind the altar. Behind the altar sits the tabernacle exposed in the center. To complement the back of the tabernacle, an etched glass, carved lit panel starburst was installed to act as a frame and also to complement the existing etched lit carved processional crucifix. The ambo, in the same way, used existing marbles and materials, and along with new marbles and new mosaic panel, created a beautiful place to proclaim the Word. It matched the altar in both materials and design. The baptismal font, which was re-located in the back of the church, became a beautiful symbol for the people as they enter into the church. The flowing waters re-circulating into the font became a reminder of the same waters they were baptized in. An on-going flowing mosaic pattern around the perimeter, as well as an etched pattern, complemented the mosaic throughout the church. The back of the font became an Ambry, where the Holy Oils are exposed for view.